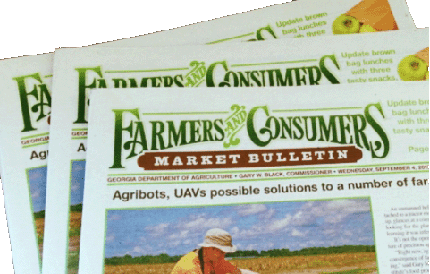 The Farmers and Consumers Market Bulletin is published biweekly (every two weeks) by the Georgia Department of Agriculture. Subscriptions are available to Georgia residents for $5 per year for the online only version or $10 per year via U.S. Mail and online. If you have an existing subscription and you are not sure when it is due to expire, look at your mailing address label (located in the bottom left corner of the front page of your Bulletin) to determine when your subscription is up for renewal. The expiration date is located to the right of your subscriber number (the 9-digit number between the 2 # symbols directly above your name). Please allow approximately 4 weeks for new subscriptions to begin.